The Strategy Unit is working with NHS England West Midlands to identify a set of clinical quality indicators which are credible in their clinical value, can be collated easily and are used to improve clinical practice. The purpose of this project is to develop a shortlist of clinical quality indicators for mental health, dementia and neurological conditions. To inform the development of the final list we would like to invite clinicians, working in these clinical areas, to complete a survey to shortlist the indicators. We will use the findings from evidence reviews, interviews and the survey to inform the shortlisted indicators. Please share the survey with your networks. The indicators in this survey have been categorised in to domains and sub-domains identified in this framework. The framework builds on the original Donabedian principles1 for structure, process and outcome measures, and have been defined according to the approaches described by Kilbourne et al 20102. We did not identify indicators for every domain and some indicators could be placed in more than one domain, but to avoid duplication we have only placed them in one. Donabedian A. The quality of care: How can it be assessed? Journal of the American Medical Association. 1988;260(12):1743-8., some indicators could have been placed in more than one category but have only been placed in one to avoid duplication. Kilbourne, A., Keyser, D. and Pincus, H. (2010). 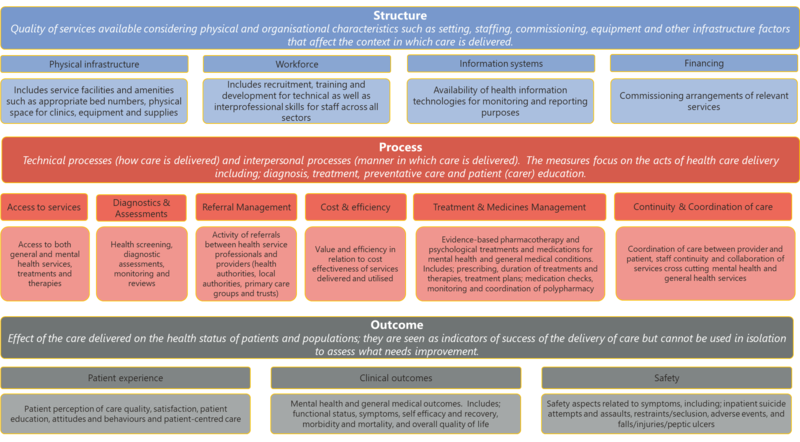 Challenges and Opportunities in Measuring the Quality of Mental Health Care. The Canadian Journal of Psychiatry, 55(9), pp.549-557. The indicators in this survey have been categorised into domains according to the domains identified in the NHS England ‘Well Pathway for Dementia’ Framework.